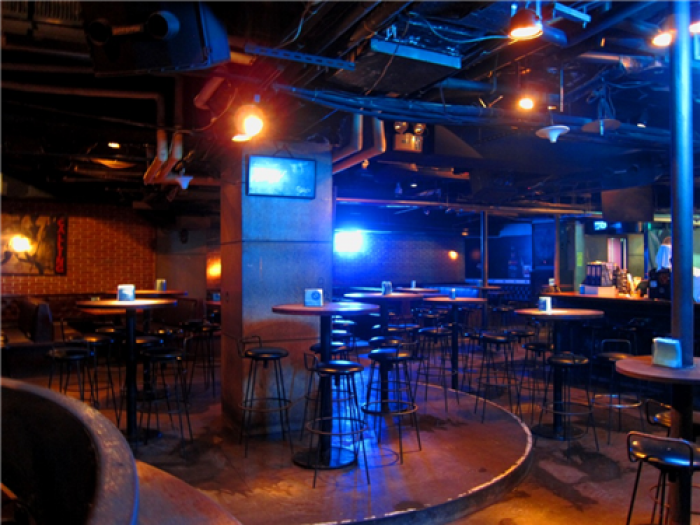 Wonder where students in Taipei hang out after their classes? Gongguan and Shida areas are packed with college and graduate students with three major universities located there: National Taiwan University (NTU/Taida), National Taiwan University of Science and Technology (NTUST/TaiKeDa), and National Taiwan Normal University (NTNU/Shida). After a long day at school, students likely just want to find a nice place to chat and throw back a couple of beers with their peers. Outdoor venues and dive bars are popular choices, keeping things more casual. So where are the students heading to when classes are over? Located above a traditional Chinese medicine store, this particular bar is well-hidden and a little mysterious to some people. Dim lights and unplastered walls decorate the room inside, along with black and white photos showing American history. It is a great place to sit and chat after a tiring day at school, and we love 45 because they often play songs from the early 2000’s which bring back memories of high school for us. They serve a vast variety of cocktails, beers, carbonated drinks, or just coffee; and also several light snacks such as fries or chip and salsa. Prices are relatively affordable too. The bar has two floors with wooden tables and chairs. Getting here before 10PM is recommended as 45 is quite popular and it gets full fast. Just want to relax with a beer after class, and not looking to get too wild? Cafe Odeon is the place for you – popular with foreigners and students because it is conveniently located near Taida. Don’t let the name fool you; Café Odeon is not just a café. Apart from its Western-style food, Café Odeon provides patrons with more than 100 kinds of beers, mostly Belgian. The menu only shows various kinds of coffee and food, but you can head straight to the bar and pick the beers you like. Overwhelmed by the choices? You can always ask for recommendation from the bartenders, they’ll gladly help you to choose the right beer for you – whether a bottle of fruit-flavored Floris or Watou’s white beer. One bottle of beer costs you about 190 NT, which is a bit steep, but the café does have a really comfy environment and big screen to watch your favorite sports. Almost like enjoying a beer in the comfort of your own living room. Taipei is definitely not lacking in its large variety of bars and pubs, but an outdoor bar a bit of a rarity within the city. Luckily for us, there is one near Taipei Water Park in Gongguan. When the weather is nice, enjoying some seafood and beer outside is a nice way to refresh the mind after those long lectures. The Beer Garden offers a variety of Taiwanese-style food such as pig intestines, which are perfect when coupled with Taiwan Beer. Beers are on tap here. Belonging to the Roxy club family, Roxy 99 is famous for its friendly environment. Jam-packed with students and young workers during the nights, you will find smiling and welcoming faces all around. This particular dive bar mostly plays rock or alternative music, and there is no dress code. Students in their glasses, T-shirts, and jeans are not an uncommon sight. Lots of tables are available for those who want to sit and talk, and the service at the bar is surprisingly quick. Roxy 99 steadily attracts foreigners, so it’s also a great place to meet people from all around the world. The sister of Roxy 99, Roxy Rocker is another definition of Led Zeppelin. Decorated in a Led Zeppelin theme and filled with loads (yeah, we mean LOADS) of vinyl records and CDs, you can even request the DJ to play any song you like. Coming to Roxy Rocker to listen to some old school rock-and-roll can definitely be a refreshing change of pace from the usual mainstream Top 40’s played at most venues (think Lady Gaga). The music is not so loud that you can’t chat with your friends comfortably, while enjoying the delicious cocktails the bartenders whip up. There are lots of casual and comfortable seats, and with the walls lined end to end with music, you might start feeling like you’re in a record store.